Darkroom collage, scanned in Photoshop. my comments desappear?.. You are right, your art is very good! ok, thank you a lot for this image!! Nice work! 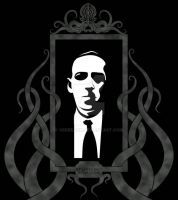 A great tribute to the Master of Horror. This is amazing work, I love it! ( ;,,; ) ie ie cthulhu fhtagn! The complete works book is the single grteatest investment I've ever made in literature. ( Plus it only cost me 20 dollars lol). Just saw it in the book store, gotta get myself one of those! God I love this author, great work!